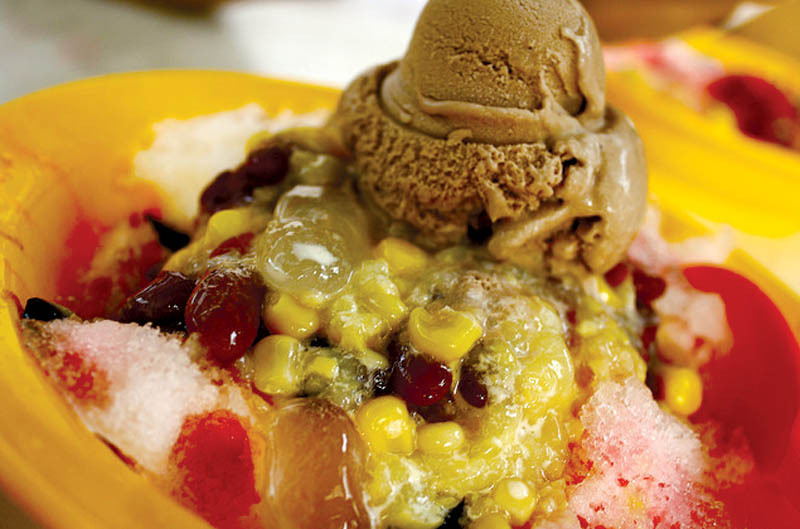 The perfect Malaysian dessert to indulge in on a hot, humid day has to be, none other than the ice kacang. Also known as ‘Ais Batu Campur’ or ABC in short, the ice kacang, when first introduced, was made up of only shaved ice and red beans. Today, you can find an array of variants ranging from the traditional one with a variety of jelly, cendol, sweet corn, red beans and peanuts under a mountain of shaved ice with evaporated milk or coconut milk and syrup drizzled over the top, to novelty ones served with durian, chocolate syrup or ice cream. (Branch at Sun Kam Wan located at ‘the triangle’ opp. BSN, Ipoh Garden). Famous for their ‘gula melaka’ version, fragrant and creamy. Open: morning till lunch time. RM2.20 per bowl. Opens daily, from morning to night. Be prepared for a big bowl with generous servings of ingredients. RM2.40 or RM3.20 with ice-cream. Opens daily, for dinner till late. Most of the stalls are established, so walk along the row and observe where the locals are having their ice kacang. We recommend the one somewhere in the middle of the row. Variants served with ice-cream and fruits available. From RM2.20 onwards. Opening hours: 6.00 p.m.-12.00 a.m. Closed on Wednesdays. RM2.40 per bowl for a smallish serve.